Providing highly engineered products and systems for passenger comfort. ITT offers a diversified portfolio of products for global aerospace markets. 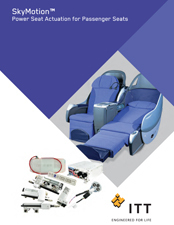 Enivate is a market leading manufacturer of control systems for aircraft seating and software components. Enivate is extremely proud of our SkyMotion™ Power Seat Actuation System. The advanced brushless motor scheme controlled by state-of-the-art software provides up to (12) axes of motion with smooth and unprecedented synchronous movement. The quiet reliability tested system meets or exceeds all aircraft industry compliance and safety standards with focus on passengers comfort and control. We invite aircraft seat manufacturers and airlines to contact us to learn more about this truly advanced system. 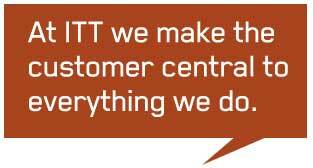 ITT has a long standing reputation of providing diversified solutions to global markets with a diverse product portfolio. Our latest seat control offerings to meet your specific application requirements. At ITT we pride ourselves on providing quality systems needed for highly customized aircraft seating applications.